Bits of My Own: If I weren't so tired, I would be doing a major Happy Dance! If I weren't so tired, I would be doing a major Happy Dance! Yes, much to the surprise of a certain individual who thought it would never happen, the rug is finally finished! I put a major push on this, worked all weekend, and finally finished it up. Next, the braid was cut off. (This part is very scary)! Then, about 8 inches was un-braided. The braids were tapered, and re-braided as far as they could be. 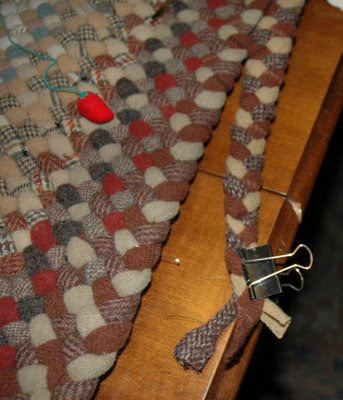 When you can't go any further, they have to be sewn to the rug. This was the part I am not too sure of. It doesn't seem strong enough. I just hope it doesn't come undone! Here is the 'rattail' finished. Then came the really hard work. The rug was very large, so all the furniture had to be moved! I bought an organic rug pad to go under the rug. Not so sure this was necessary, or a good idea now. It was very hard to maneuver it into place, position the rug over it, and then cut around it. Of course it wound up a bit skewed under the rug. Unfortunately the rug did not lie totally flat! Really an OMG moment - My worst fears! Thank God for my steamer! It really worked wonders! 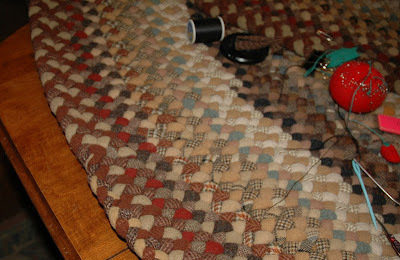 The rug lies mostly flat now, and hopefully over time one of the other ripples will work its way out. If not, I can live with it the way it is! The final measurements wound up 95-1/2 inches (8 ft) wide by 11 ft-6 inches long. A good bit of it wound up under the couch but due to the long thin shape of the room, there was no avoiding that. Gracie had to position herself right in the center to inspect it. This was before the rug pad was cut around it. The problem with it was the weight of the rug. It is extremely heavy and maneuvering it, especially on top of the rug pad, is a really tough job. Oh my aching back! Literally! I pulled some muscles moving the furniture that put me out of commission yesterday, but today I am a little less sore, and yes, I am very, very happy that it is finished! 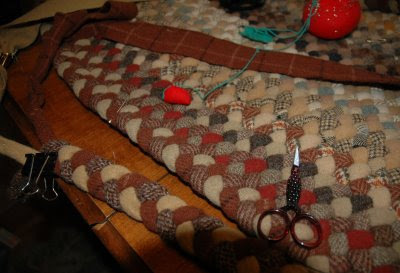 I will make another one for the dining room (much smaller), and I will make some small rugs for the traffic areas on this rug, but I will be taking a break for a while. Keith helped with all the furniture moving. He thinks the rug is ok, just ok, not sure it was worth all the work. Just okay?? No way! The rug is amazing!! Huge congratulations to you on a fabulous finish. How about we dance for you?! CONGRATS on a very awesome finish!!!! That is so amazing! You must be truly diligent to finish such an enormous project. Congratulations! Men! Couldn't you just wring his neck saying it's just okay???? It's absolutely gorgeous and I can't imagine such an undertaking. Girl, you definitely deserve that happy dance. Job well done. Oh my. That is a serious big, beautiful rug. It is gorgeous. You deserve more that a happy dance. All I can say is "Men!!!" Hope you back is ok. - Sandra. Wow, Erica...it looks fantastic! I'm sure the weight of the rug will pull itself flat in no time. Hey, Gracie, the Offical Rug Inspector, approves...so Keith doesn't matter! Huge congratulations Erica, it looks amazing. Gracie sure is giving the rug the once over. Oh my gosh!!!! It's absolutely gorgeous. oh my!!! you finish it!,,wonderful and amazing work!, congratulations. WOW ! WOW ! WOW ! Congrats on the most amazing piece of work !! It's fantastic ! Wow, Erica, this rug is just fantastic, not just okay. What a piece of great work! OMG, that is an awesome rug. I knew it was big, but when you listed the size, it blew me away. You have made an heirloom. Men think everything is "Just Okay". My man says the same thing when I expect more of a reaction. 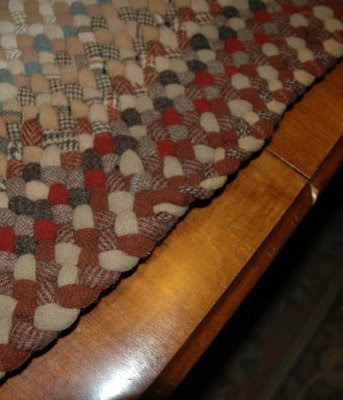 How wonderful to see one of these rugs again! It brings back memories of my mom and aunt braiding them...I remember being fascinated with the colours. Thank you for the memories....your rug is GORGEOUS!!!! !